The 2017 Iditarod sled dog race officially started on Monday. The race was once again moved up to Fairbanks for the start, due to sketchy snow conditions on the southern route in the Alaska Range. The temperature was -38F along the Chena River, as the first mushers and their teams took off for Nome. One thing about March weather in the Interior, is that 30 degree plus temperature swings are common in a day, now that the sun has a little power to it, and the days have become as long as those in the Lower 48. 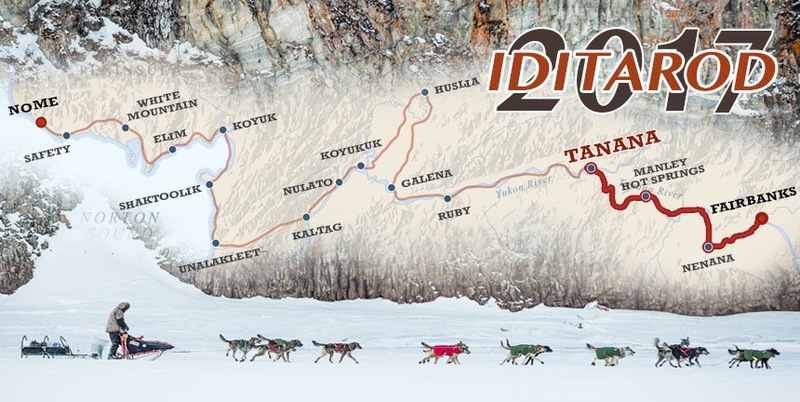 As of Wednesday morning, the majority of teams had reached the Tanana checkpoint, and are now traveling down the Yukon River to Ruby. This entry was posted on Wednesday, March 8th, 2017 at 5:16 PM	and tagged with cold, Fairbanks, photo, racing, travel and posted in Alaska. You can follow any responses to this entry through the RSS 2.0 feed.